Empower yourself with essential first aid training. Courses held weekly at our Victorian campuses. iTFE’s first aid courses provide hands-on training for participants looking to make a difference in the workplace and at home. We provide training in four first aid courses; Provide Basic Emergency Life Support (First Aid Level 1), Provide First Aid (First Aid Level 2), Provide Cardiopulmonary Resuscitation (CPR) and Provide an Emergency First Aid Response in an Education and Care Setting. Taught by professionals in the industry, our training centres are equipped with state-of-the-art first aid equipment, CPR kits, first aid bandages and anaphylaxis training equipment. Our Nationally accredited courses are geared to provide you with the essential first aid skills you’ll need at home or within a large range of industries, including manufacturing, work-sites and office environments. There's a huge calling in Australia for people to engage themselves with an understanding of CPR. 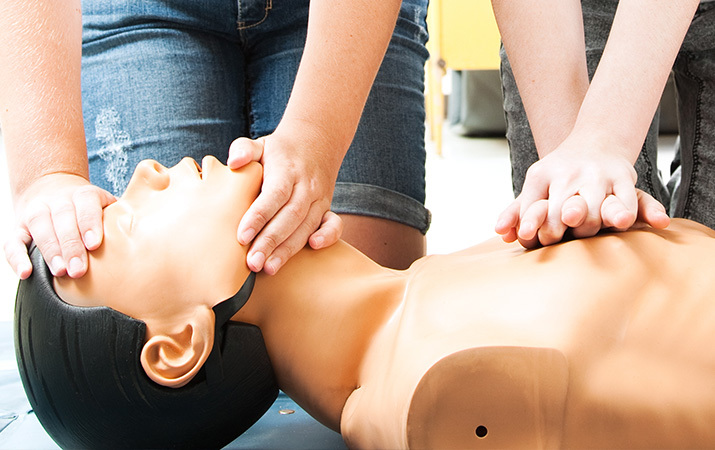 This course will teach you CPR, the most common life-saving measure used in first-response treatments. Learn basic first aid skills including caring for minor wounds, basic life support and emergency response techniques in this nationally accredited course as well as CPR, and be equipped to save a life. Gain a thorough understanding and the practical skills in providing first aid response, life support, and the management of casualty(s), the incident and other first aiders until the arrival of medical or other assistance. The course includes CPR. Do you work in childcare or in education? Then this specialised first aid course will be perfect for you. In this 8-hour course, you'll grasp an understanding of CPR, emergency response techniques, allergy management, first aid rescue procedures, asthma and anaphylaxis training and more.